"Delicious glazed sprouts. Our family loves them with lots of bacon. While we do enjoy them prepared lighter, this is a great quick side dish for a special meal. Also perfect for holiday get-togethers." Combine Brussels sprouts and bacon in a cast iron skillet; season with salt and pepper. Cook, stirring occasionally, until Brussels sprouts start to brown, 15 to 20 minutes. Drizzle 1/2 cup of balsamic vinegar on top. Transfer Brussels sprouts and bacon to a serving platter; drizzle remaining balsamic vinegar on top. 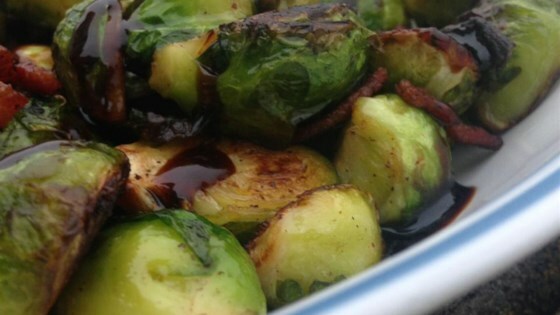 See how to make simple Brussels sprouts with a warm bacon dressing. You can also roast these at 425 degrees F (220 degrees C) for 20 to 30 minutes. Very good, quick and easy! Great recipe! We added some chopped onion, fennel and a little minced garlic. This this the 2nd time I've made this and everyone loved it. Might not make it to the serving dish! YUM!